We're a 'Roll up your sleeves' bunch that believe in providing our guests with experiences to remember. Skybar & Kitchen ESTD 2017 - focuses on bringing Passion and Creativity to South-East suburban Melbourne, with a scope of providing sensuous Modern Australian dishes and Beverages, pulling influences from the Indo-Pacific and European corners of the globe. We work with local providores and suppliers in creating Dishes and Drinks that embrace the abundance of amazing Victorian and Australian produce available at our door-step. 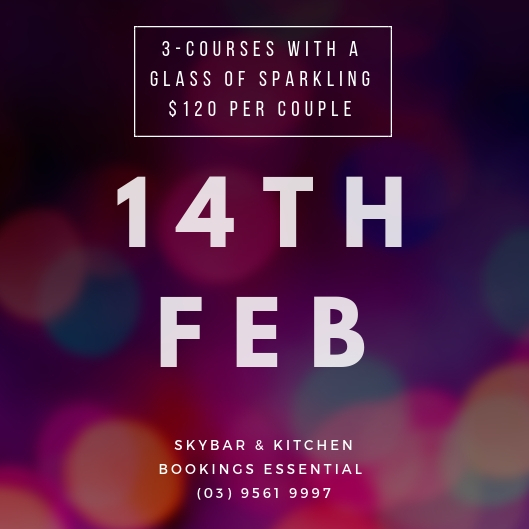 Bookings Essential - Please call (03) 9561 9997 to book. One Free Main when another Main of equal or greater value is purchased - Limited to one nominated "Dad" per booking/table. Get your Boogie On with DJ BLACK DAVE from 9-1am Australia Day Weekend! Hate Entry? Love Unlimited Party Pies? WE GOT YOU COVERED!